"You elaborate in your lectures the unique powers of Sai, the incidents that are described as 'miracles' in books written about Me by some persons. But I request you not to attach importance to these. Do not exaggerate their significance, the most significant and important power is, let Me tell you, my Prema (Love) and My Sahana, (fortitude). I may turn the sky into earth or earth into sky but that is not the sign of Divine Might. It is the Prema, effective, universal, ever-present, that is the unique sign. When you attempt to cultivate and propagate this Love and this Fortitude, trouble and travail will clog your steps. You must welcome them, for without them, the best in you cannot be drawn out." "I use My Shakti (power) to attract people and to draw them towards the Godward path. These miracles are merely baits with which I lure them towards Me. Once their faith is firmly established, they begin to look beyond the miracles and slowly start stretching their hands out for what I have really come to give- Knowledge and Bliss." "There can be no limit for Sai Power, no hindrance, no opposition or obstacle. You may believe it or you may not, but, Sai Power can transform earth into sky, the sky into earth. only there is no call for that transformation. This Divine behaviour is far distinct from the mean exhibitionistic tricks of the inferior powers. This is spontaneous manifestation, not those that are calculated to collect customers and exploit the ignorant." "Those who profess to have understood me, the scholars, the yogis, the pundits, the jnanis, all of them are aware only of the least important, the casual external manifestations of an infinitesimal part of that power, namely, the miracles! They have not desired to contact the source of all power and all wisdom that is available here. They are satisfied when they secure a chance to exhibit their book-learning and parade their scholarship in Vedic lore, not realising that the person from whom the Vedas emanated is in their midst, for their sake. They even ask, in their pride, for a few more chances. This has been the case in all ages. People may be very near (Physically) to the Avatar, but they live out their lives unaware of their fortune; they exaggerate the role of miracles, which are as trivial, when compared to my glory and majesty, as a mosquito is in size and strength to the elephant upon which it squats. Therefore, when you speak about these miracles , I laugh within myself out of pity that you allow yourself so easily to lose the precious awareness of my reality." "I am determined to correct you only after informing you of my credentials. That is why I am now and then announcing my nature by means of miracles, that is, acts which are beyond human capacity and human understanding. Not that I am anxious to show off my powers. The object is to draw you closer to me, to cement your hearts to me". "You may infer from what you call my miracles that I am causing them to attract and attach you to me and me alone. They are not intended to demonstrate or publicize; they are merely spontaneous and concomitant proofs of divine majestys." 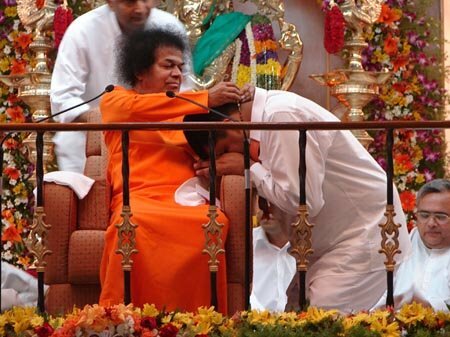 "This Sathya Sai Incarnation is one where you see the full manifestation and exercise of all the sixteen attributes of a Poorna Avatar. This happened only once before, at the time of Krishna Avatar. I am the Embodiment of Shiva and Shakti, that is Universal Consciousness and Universal Energy. And I show evidences of both to the fullest and maximum extent". "Do not crave from me trivial material objects: but crave for Me, and you would be rewarded. Not that you should not receive whatever objects I give as signs of grace out of the fullness of love. I shall tell you why I give these rings, talismans, rosaries, etc. It is to mark the bond between me and those to whom they are given. When calamity befalls them, the article comes to me in a flash and returns in a flash, taking from me the remedial grace of protection. That grace is available to all who call on me in any Name or Form, not merely to those who wear these gifts. Love is the bond that wins grace. My miracles are part of the unlimited power of God and are in no sense the product of yogic powers which are acquired. They are natural, uncontrived. There are no invisible beings helping me. My divine will bring the object in a moment. I am everywhere."